This has been an idea I have had in my head for almost a year! It just took me awhile to perfect it. Let me introduce to you the exclusive Art School Dropout Pin Cushion! The bottom part is made just like a lot of my jewelry over the years. It is a lightweight hand cast plastic that was made using molds I created. Each one is one of a kind since I mix the pigments myself and the fillers. The inside of the pin cushion is a felted wool and is very dense. It will grab on to your pins and keep them super snug until you need them. For this specific update I only added a small handful of variations. I didn’t want to overwhelm myself with shipping. I’m holding on to the second batch of these for a shop update in April! You can find all of these pin cushions plus other awesome sewing notions in the shop. I decided a few months back that I still really love casting plastic, like a lot! I have started setting up custom listing in my Etsy shop so when I do cast, I’m only casting what customer like, not just what I feel like making in hopes other will like it all. 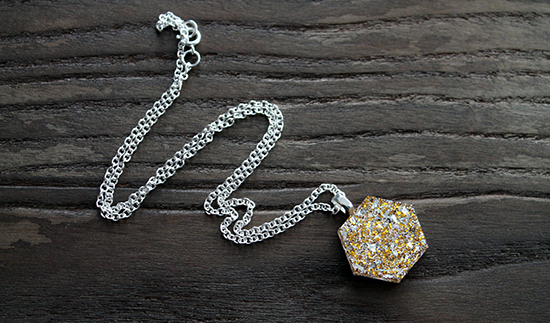 So, if you have ever wanted a custom Hexagon or Quilt Block Necklace, or maybe a set of charms that spell out something awesome or ridiculous, then now is the time. I’m casting all week!!! There is this fun little tradition at QuiltCon I learned about, where people get 1″ buttons made with their name/business name/etc on them and they go around swapping with other people. They show them off on handmade lanyards or bags the whole trip. It’s a fun way of networking and helps break the ice when your meeting internet friends in real life for the first time. Absolutely brilliant! I wanted to partake, and was about to go searching for my 1″ button machine, when the little light bulb over my head went off. Why not cast some pins? I had been trying to give myself some excuses to pour plastic again, because I really missed it. Perfect. I ordered some plastic and silicone and started making mock up designs. This was in early January. I made around 200 of them, and will be bringing 150 with me to QuiltCon. The rest with be held on to for the shop and for myself. So if you’re not attending, keep an eye on this here blog for a shop update announcement. 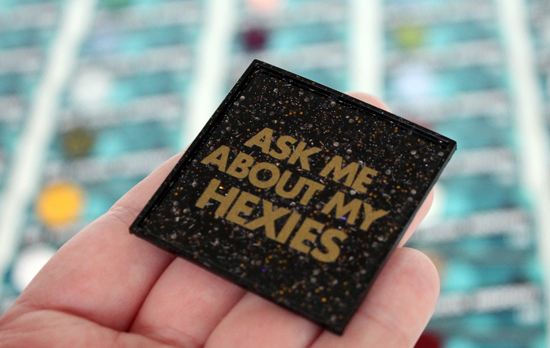 For anyone going to QuiltCon who gets one of these pins: Take a photo of you, your bag, your pet, your friend or anyone else wearing one of these glittery hexies and tag me @jessee_artschooldropout with the hashtag #showmeyourglitterhexies for a chance to win a matching set of hexagon hairpins, necklace and ring! (I’ll have photos of the prize when I get home) I will take entries until the end of March, just to give everyone a chance. I’m really hoping this helps me be more social. Sometimes I get super anxious around a lot of people, and I really want to make the most of my trip. So if you see me walking around, please come say hi and “Ask Me About My Hexies”, no need to have pins to swap, saying hello is enough! I talked a bunch about quilt swaps lately, and just how much I love them. I also commented on applying to be part of a few more! Well, above you can see a piece I made for the Studio Ghibli Craft Swap I’m in. It’s a swap purely dedicated to everything Studio Ghibli (think Totoro, Spirited Away, Ponyo, Castle in the Sky, Kiki’s Delivery Service, etc etc) and can be any type of handmade project! My partner likes Totoro A LOT! So I sculpted, made a mold of, cast and then painted this little dude. I think I’m going to make him into either a brooch or a needle minder. The piece measures almost 2″ wide and is about a half inch thick. I cast a few in a black with a little added glitter to make it fancy. The mold had a few bubbles (I Think something was wrong with the sealant I used on the clay) but I decided it added to the texture of the whole thing and didn’t make a second mold. I really hope my partner likes it. It was a fun item to make and it’s got me itching to sculpt again. I have soooooo many toy ideas. SO MANY! P.S. : I won’t be making any to sell, but I am up for using them in trades. Like “I’ll swap you some fabric, thread, toys, etc for a brooch” type of thing. IN about 10 days I will be boarding a plane all by myself, and flying to Austin, TX for this years QuiltCon. The last two years I did BlytheCon (I STILL need to blog about that experience), and this year I decided to mix it up a bit and go the quilt route. I had this brilliant idea to pull out some of my old molds and make a few quilt inspired necklaces for myself, my hotel roomie and a handful of friends. I posted a teaser on Instagram and they were a big hit. So of course I went overboard as usual and cast a bunch more!! Any that aren’t already spoken for will go up in my etsy shop Late Feb/Early March once I get back from my upcoming trips. I’m also working on a few other block designs for fun, and I’m totally up for suggestions!! Ive had this idea in my head lately to try and make more pieces for the home, instead of the body. It might have something to do with cabin fever or the fact that I always feel like changing things up a bit in winter, but whatever the reason, I’m excited. The first piece I’ve tested out is shown above. They are hand cast plastic “Home Sweet Home” banners. Hopefully the first in a series I’ve been dreaming up. I want a full range of colors before I add them to the shop, so it might be a week or two before I get proper photos. What are your thoughts? Any colors I NEED to make?